Well I don’t know about you, but I always find that I eat more at Christmas than any other time of year. Apart from the obvious culinary delights of Christmas Day itself, there are mince pies, chocolates, Christmas cake, Christmas log and myriad other deliciously-treaty things to eat. And whilst I no longer eat myself to sickness, as I did once at my Nana’s when I was about eight, it’s very easy to suddenly find myself feeling over-full and uncomfortable. Fortunately, there are homeopathic remedies that can help in such circumstances. If you were going to ensure that you had just one remedy with you I would go for nux vom. As well as being an excellent hangover remedy nux vom is also very handy for general overindulgence. If you have heartburn and your stomach and abdomen feel sore or bruised and sensitive to pressure, nux vom is likely to bring you some relief. If you want to have a few different remedies handy, carbo veg is very good if it feels like your digestive system has just given up the ghost and stopped working altogether, your stomach feels heavy and full and you may feel sleepy. Lycopodium may be helpful if your abdomen is bloated even after only eating a little and you have lots of noisy wind. Heaven forbid that your Christmas should be spoiled by food poisoning! Just in case you could get in some arsen album. You will know if you need to take it if you get gnawing and burning pains, sickness and diarrhoea and particularly if you get very chilly and anxious. You can get all of these remedies from health food shops and maybe even Boots. Get them with a 30 after the name and take them as directed on the tub. Surviving the party season … hangover free! Of course, we all know that some people will say the best way to ensure that we don’t have a hangover is “avoid alcohol altogether” and where’s the fun in that? The next best way is to “take more water with it”, as my granny used to say. I think in my granny’s day, that referred to whiskey and the dilution of such. Water can, in fact, be a huge help in the prevention of hangovers as dehydration is the biggest culprit in that banging head, slightly nauseous feeling. Making sure that you are well-hydrated before you go out and remembering to have at least half a pint of water in between anything else you are drinking, will go a long way to helping you feel OK the next day. And then there’s the homeopathic remedy nux vomica – know in homeopathic circles as “the hangover remedy”. If you know you are likely to be drinking more alcohol than usual, take a nux vom before you go out. Then take one when you get back in, drink at least half a pint of water (a pint if you can manage it) and have another nux vom before you go to bed. Hopefully, when you wake in the morning you will feel OK. If you are still feeling a bit the worse for wear, have more water (a pint would be favourite), a glass of orange juice and another nux vom. In fact you can take a nux vom every hour until you do feel better. You can get nux vomica from most health food shops, direct from Helios or Ainsworths homeopathic pharmacies or even most Boots stores. Nux vomica 30 is what you want. Like you’re only half there? You haven’t got a cold or the flu, but you’re just feeling not quite right. That’s how I was feeling last week. That not-quite-properly-awake, first-thing-in-the-morning feeling was lasting until the afternoon. It was difficult to think, plan and get myself going. I was drinking plenty of water (;D) and even coffee didn’t seem to help … and then I remembered. Echinacea! That’s what I needed. And that’s what I took. Ten drops in a little juice, first thing in the morning and last thing at night and now I’m right as rain! Oh, yes and vitamin C. My preference is for the Aspartame-free, chewable type that I get from Healthspan but of course, you can get vitamin C from all health food shops and places like Boots. As you can Echinacea. Just remember not to take Echinacea for longer than three weeks at a time, otherwise you could end up feeling worse than you did when you started! Can you help with my anxiety? This is another great question and thank you for asking, MR. Although, as usual, there are lots of questions I would like to ask in response, I can at least say that yes, EFT and homeopathy, individually and/or together are excellent tools for helping with anxiety. As is, you maybe surprised to know, drinking water! When we are dehydrated our bodies go into “drought-management” mode and release hormones into the bloodstream which can cause us to feel anxious. To know whether or not you are dehydrated, just check the colour of your urine. If you are properly hydrated, your urine will be a colour between clear and very pale yellow. Anything darker than that indicates dehydration. There are over three hundred different homeopathic remedies that could help with anxiety and panic attacks and finding the right one for any particular individual involves careful understanding of that person’s experience of anxiety, as well as a good knowledge of their life history. Tapping along with the exercise “EFT Demo – Feeling Bad” – using your own words may help in the short term. For more long-lasting resolution, working with a practitioner is likely to be helpful. Who Wants a Cold or the Flu? Nobody, right? Or do you? If you think about it, colds tend to occur at specific times of the year – Winter and Spring – and it’s possible that a cold is your body’s way of adjusting to the new season. So maybe the best thing to do when you get a cold is to take a couple of days off work and look after yourself. Get plenty of rest and sleep, drink plenty of water and orange juice (packed full of vitamin C) and maybe even treat yourself to a warming hot toddy (recipe coming in tomorrow’s blog). This will give your body the best possible chance to do what it needs to prepare itself for the oncoming season. Homeopathy can help with cold and flu symptoms, in fact there are over thirty different medicines that can help with flu and many more that may help with a cold. Here are the details of the three most commonly used homeopathic cold and flu medicines – if your symptoms fit, give the medicine a try. If none of these seem to fit your symptoms, take a look here where there are many more to choose from. Aconite: You really want to keep this one in your medicine cupboard because it is a great remedy for nipping a cold or flu in the bud when the symptoms have come on quickly. Take it as soon as you notice the first symptoms – which is likely to be after you have been out in the cold. You will have lots of sneezing with pain at the root of your nose. Your mucous membranes will be dry, you may have lots of shivering, feel quite anxious and feel worse in the evening or at night. Ferrum phos: This medicine may help when your symptoms come on gradually. You may have a sore throat and a feeling that the cold is going to affect your ears or your chest. You may feel weak and leathargic and have a flushed face and your eyes may be red and burning. Gelsemium: This is the most commonly used homeopathic medicine for flu – you have the common flu symptoms of feeling heavy, lethargic and dull, your limbs ache, you feel dull and you may have shivers running up and down your back. How do I get back to sleep when I wake up at 3am-ish? This is a great question Sam – thank you for asking. As a homeopath, there are lots of questions I need to ask in response to it. Irritating, I know – answering a question with more questions! Here’s the thing though, when I look in my book of symptoms (known to homeopaths as The Homeopathic Medical Repertory), under the symptom “Wakes at night at 3.00 am” there are 48 different medicines to choose from. So, I need to work out which of those 48 is going to be the best one for Sam. To begin with, I want to know how long Sam has been experiencing this problem and what was happening when it started. Then there’s the question of how Sam wakes. You see some people wake suddenly, or as if they’ve heard a noise, or from hunger or thirst, from dreams, heat or coldness, needing to go to the loo, or from perspiration. For other people, the waking seems to be causeless. After that, it’s what is keeping Sam awake? Is it thoughts of business, anxiety, restlessness or just feeling wide awake? Has Sam got any idea what is causing this sleep problem? And how has Sam been feeling since the sleep problem started – more irritable than normal, weepy, or just tired? So, before I can recommend a homeopathic medicine to help Sam with this sleep problem, I need quite a lot more information. In the meantime, what you could try, Sam, is to drink some water when you wake up and take a tiny bit of salt – straight salt if you can bear it and, if not, a couple of crisps or something similar. A drop of lavender on your pillow may help you to feel more relaxed and sleepy. And then you could just do a bit of tapping. If you don’t know about EFT you can go here and watch the demonstration on “Feeling Bad”. Instead of saying “Even though I’m feeling like this” you can tap in the same way and say “Even though I can’t get back to sleep” as you tap on the karate chop point and then as you go through the points from the top of your head to under your eyes you can say “Can’t get back to sleep” and from under your nose to under your arms you can say “Choosing to relax now”. Then you can go through all the points from the top of your head to under your arms alternating “Choosing to relax” and “Choosing to go back to sleep”. Sleep? Terrible! Insomnia most nights. 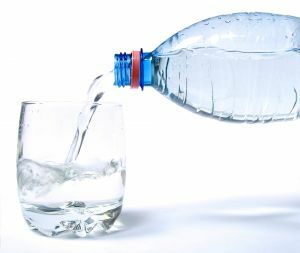 Now, as you may or may not know, my first prescription to most people is “drink more water” and this client had duly started to increase his water intake in the week between our introductory chat and his initial consultation. Job done. On that front at least! The content of this blog is based on my personal knowledge and experience and does not constitute evidence.